Hurricane Earl - Cape Cod Friday? It's looking like we may get some big waves and high winds for this coming weekend, Labor Day weekend. What has been the best weather summer in recent history may end with a howl. 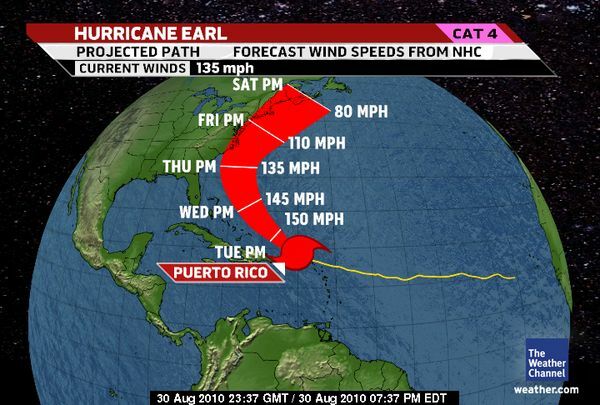 The current thinking is that Earl will brush by Cape Cod, but not hit us directly. We'll need to keep an eye on this storm as the week progresses. Read "Hurricane Earl Barrels North on CapeCodOnline.com". Below is a capture last night of the projected path. New Listing - Bayside Beauty - A Great Rental! 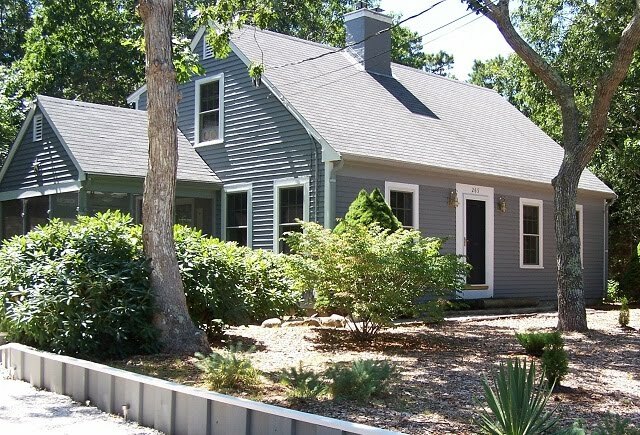 EASTHAM - This is a completely renovated expanded Cape that's just a short walk to Eastham's Campground Beach. It has 3 good sized bedrooms, a large den upstairs, 2 full baths, a screened-in porch, open kitchen/dining/living rooms, all on a quiet paved road. You'll find hardwood floors downstairs, new carpeting upstairs, new counters, fresh landscaping, new tilt-out Anderson windows throughout, and a newer roof. This house has been a great rental and could be a wonderful retirement or second home for your family. Available furnished, with only a few exclusions. Priced at $449,000. Exclusive! Check out this listing at http://265BaywoodRd.robertsheldon.com/. More photos, a Virtual Tour, and a Map. Check it out! Would you like a snapshot of the current marketplace in Eastham? Go to http://snapshot.robertsheldon.com/ and check it out! Call me at 508-237-9545 if you'd like an appointment to see this new listing! More Seals Equals More Sharks - Surprise! Way back when - there was bounties on seals. The bounties are gone, they ended in 1962. The Marine Mammal Protection Act, entered into law in 1972 included seals even though they were not endangered. That was 38 years ago (check my math here). Since then we've had a fairly steady increase in the number of seals. Seals eat a lot of fish. And, they hang out together in large bunches. Currently they hang out on Monomoy Island, Chatham's outer beaches, the Nauset inlet near Orleans' Nauset Beach, and up in Truro, near the P-Town line. Not surprisingly, these locations are where great white sharks have been spotted. I've simplified the situation, but you can read the whole article on the Cape Codder's website.... Here. 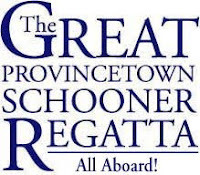 The Great Provincetown Schooner Regatta is an annual sailing and educational event that honors P-Town's maritime history, as one of the oldest and largest fishing ports in New England, and the great natural resources of it's harbor and Cape Cod Bay. The event promotes public awareness of the important role that Schooners, Cape Cod Catboats and other historic vessels played in our unique economic and cultural history. In addition to historic vessels, all classes of modern sailing vessels are invited to participate in various races. There are individual races for Catboats, schooners, and other classes of boats. The Fishermen's Cup Challenge will take place September 7th. This is a schooner-only race from Gloucester to P-Town, commemorating the 1907 Lipton Cup race, when the schooner Rose Dorothea of Provincetown was victorious. This upcoming Saturday is the second of two annual meetings of the Eastham Part-time Residents Taxpayers Association. It'll be at 9 AM at the Eastham Elks Club, on McKoy Rd. The EPRTA is the largest part-time taxpayer group on Cape Cod. These meetings are incredibly interesting and will answer all kinds of questions on the issues facing non-resident taxpayers. Last night Bev & I went to get us some culture. We drove to Hyannis for dinner and a concert. We saw the Temptations and the Four Tops at the Cape Cod Melody Tent. It was a blustery night, so the tent rocked with the music. We were the youngest folks there (not true - I'm sure someone brought their grand-kids, but the lady next to me was on oxygen). A fun time, since these were the songs we heard in kindergarten (not true - it was high school). 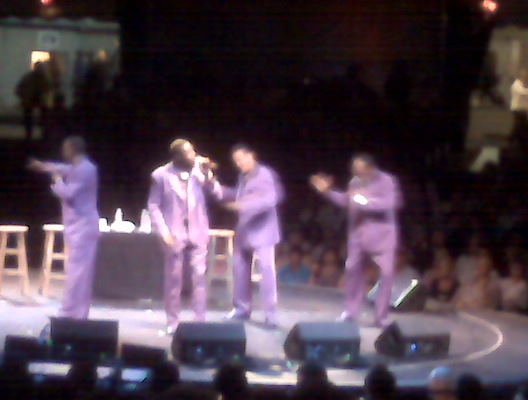 And I haven't seen lavender leisure suits since.....???? Although the season is nearly over, it needs to be said that the Cape Cod Melody Tent has some fabulous entertainment for all ages during it's summer season. Check out the schedule on their website.... Here. It's a unique venue with no bad seats. We sat in the last row (row 19) in the back of the tent, but the revolving stage provided us with great viewing for the show. Lastly - for those who are nostalgic for the old sounds, here's the Four Tops doing "My Girl" on Youtube. This song was huge in 1981 (well after my kindergarten days). Enjoy! It seems difficult to believe that interest rates are firmly in the mid-4%'s (30 yrs, no-points). I happily paid 7.5% for the life of my mortgage for my home in New York, while folks who bought just a few years later were well above 10%. 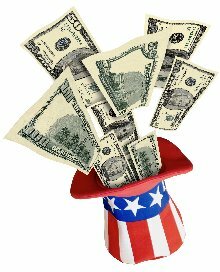 SmartMoney magazine ran an article on their online magazine that discusses the possibilities for the near future. 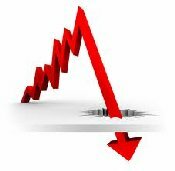 Read the article .."How Low Can Mortgage Rates Go?". A banker I spoke with last week suggests that we should look no further than the unemployment data for clues. He theorized that the rates won't rise much until the unemployment figures get significantly better. Nice theory! Although it's taken me a couple years, I finally got to a major milestone in Blog-dom, my 500th post. Since late August, 2008, I've managed to find and/or create articles that interest my readers, mostly folks that love Eastham and Outer Cape Cod. I hope you'll continue to find this blog interesting, informative, and worth the few minutes that it takes to see what's on my mind, and what's happening on the Outer Cape. The Boston Globe's online edition ran an article, with lots of photos, highlighting some of the Cape's most beautiful and historic homes. 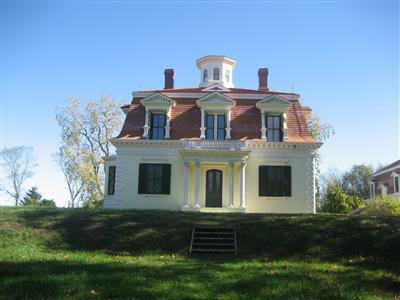 Eastham's Captain Penniman House, the home of the wealthy whaler Captain Edward Penniman, is one of the featured homes. Check out the article.... Here. 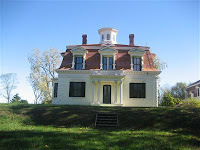 Built in 1867, the Captain Penniman House is in the Fort Hill area of the National Seashore and is on the National Register of Historic Places. The house has been refurbished, and features many original items. Open houses and tours are offered by the National Seashore. The Orleans Chamber of Commerce is presenting the 21st annual Pops in the Park will take place at Orleans' Eldredge Field on Saturday, August 28th (rain date August 29th). The field will be set with tables for 2 and 4 and with theater seating. The Pops will be provided by the Cape Cod Symphony Orchestra, with performances by the Parkington Sisters and by Ashley Wade. General admission is $20 per seat ($25 the day of the concert), with table seating at $75 per person. Table seating participants get light snacks and water and (importantly) may bring there own food and beverages. Go to http://www.popsinthepark.com/ to get mare details and find out where to get tickets. My September Eastham real estate newsletter is available now. It has Eastham's results through July's sales, and Part 2 of my mid-year report of the real estate marketplace, with a summary of the results for our neighboring towns. Also, you'll find a new listing and info on Eastham's Windmill Weekend. In short, the Eastham market is improving, both in terms of sales volume and sales prices, back to the pre-2009 levels. Yeah! Download your copy of my September newsletter ..Here. It's 'that' time of year again, when the diamondback terrapin turtles hatch on our beaches and crawl to the Bay. These baby turtles are endangered, both individually and collectively. Beachgoers need to watch where they walk. The latest 'sightings' of these baby turtles have been on Lieutenant Island and Eastham's Cape Cod Bay shore. Read the article in a recent Cape Cod Times online edition. The Federal government has a number of energy related rebates (mostly in the form of tax credits) that expire at the end of 2010. Likewise, many states has plans that are expiring soon. Massachusetts had a special tax credit for energy efficient appliances, which unfortunately has expired. Some eligible items for a federal tax credit include insulation, windows and doors, roofs, heating, ventilating and air conditioning systems, water heaters and biomass stoves. Additionally, a tax credit is also available for some more advanced energy improvements, including solar panels and wind turbines. There are lots of 'details, so start by reading the article on the Wall Street Journal's MarketWatch website.,, Here. One of the details is that the home must be your primary residence, not a rental home. 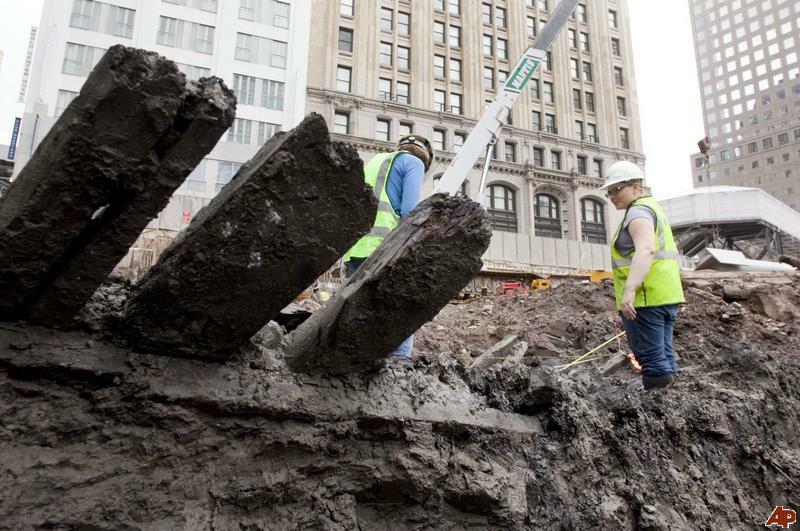 A few a weeks ago remnants of a large wooden ship were found in the excavation for the new buildings to be built on the site of the World Trade Center. As you might expect, the folks who do forensic history (is that the right term?) are having a field day. And they should, since this ship was probably dumped (sunk?) as part of the landfill as they extended Manhattan Island south toward what is today Battery Park. Read this article about the ongoing work of preserving and understanding the history behind these interesting findings. A well designed, and very useful, new website has been launched with the purpose of encouraging increased vacationers for Wellfleet during the Spring and Fall shoulder seasons. The website was developed and funded jointly by the Wellfleet Chamber of Commerce, the Town of Wellfleet, and the Wellfleet Harbor Actors Theater (WHAT). The website has a good calendar, Wellfleet news, weather, and links to many Wellfleet businesses. Check it out...Here. 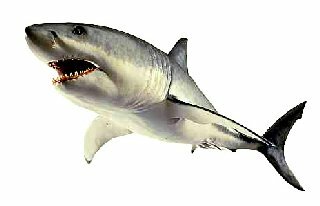 Chatham beaches are closed indefinitely after numerous shark sightings this past week. Sharks were sighted just a short distance from swimmers. Lately, harbor seals have congregated on several of Chatham's sand bars - and these seals are the preferred snack food for the sharks. Officials can't say when this popular five-mile stretch of beach will reopen. Check out this great video from the Weather Channel. Surpluses and shortages happen all the time. Likewise for supply & demand. There is an article on SmartMoney.com that argues that the current building slowdown will result in a serious shortage as early as 2012. How this will effect the Outer Cape or Eastham is impossible to determine. Read the article here. The P-Town Pilgrim Monument Is 100 Years Old! The Pilgrim Memorial Monument was dedicated in 1910 to commemorate the landing of the Mayflower in Provincetown Harbor and the signing of the Mayflower Compact. The Compact was America's first democratic constitutional document assuring equality and justice for everyone. This week, on August 5th, they will be re-dedicate the tower. There will be a full day of activities, starting with a parade, the re-dedication, a concert and fireworks. Check out the day on the Monument's website. There were 12 closings in July (same as June) with an average sale price of $450K, and a median of $457K. This year, July's closings totaled $5.4M. Last year's total was $4.2M on 10 sales. 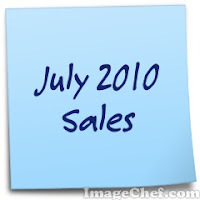 There were 64 closings year-to-date (7/31/10), up 60% from 2009's 40 sales. Currently, there were 103 homes for sale in Eastham, with an average list price of 599K, and a median price of $469K. For more details, graphs, and commentary, subscribe to my monthly newsletter...Here.